False advertising claims are governed by a variety of state and federal laws. The FTC may punish repetitive or widespread violations. www.ftc.gov/bcp/reports/dietadvertisingcases.shtm – ( Dietary Supplement Advertising Cases). The New Jersey Consumer Fraud Act prohibits the act, use or employment by any person of any unconscionable commercial practice, deception, fraud, false pretense, false promise, misrepresentation, or the knowing, concealment, suppression, or omission of any material fact with intent that others rely upon such concealment, suppression or omission, in connection with the sale or advertisement of any merchandise. They provide additional damages with legal fees to be paid by the defendant. New Jersey has particular advertising regulations. 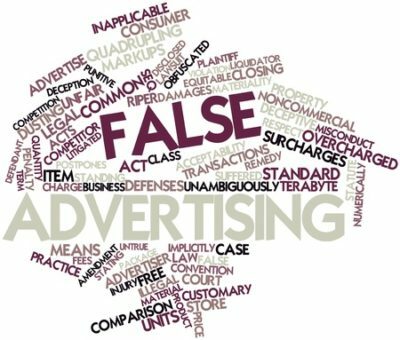 These advertising regulations various size and placement practices, with a violation creating liability without proof of an intent to defraud.